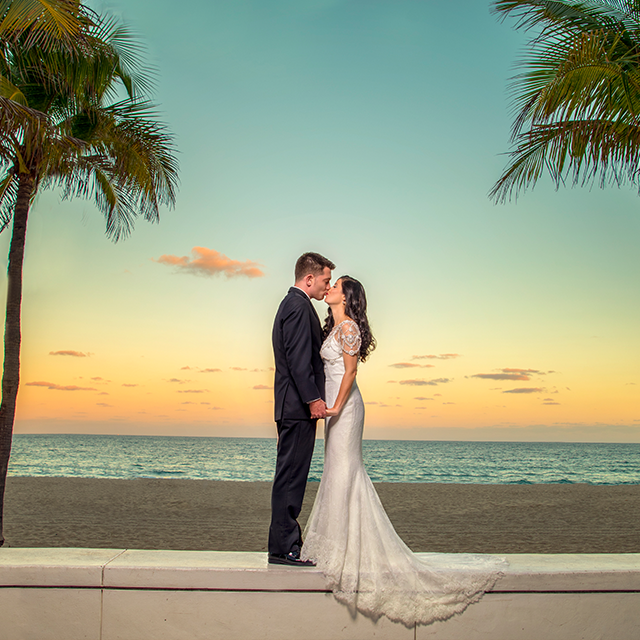 Greater Fort Lauderdale sets the perfect stage for a barefoot beach wedding with 23 miles of sparkling sand beaches and individual beach communities. It&apos;s important to check with each beach community of the rules and regulations on having a wedding on the beach. Below is permitting information for those beaches that require one. Click for a wedding officiant who specializes in beach weddings. The City of Dania Beach requires a permit for beach weddings, which is $100. Applications must be filled out and submitted 60 days prior to the event, including payment of all applications fees, to Martha Riguero of City of Dania Beach, Parks & Recreation Offices. Deerfield Beach offers three places available for rent, including the 9th Street Boardwalk, 10th Street Boardwalk and The Garden Area, located on the beach across from the Embassy Suites pool. The rental fee is $318 plus $100 refundable deposit and a beach wedding permit is required. Wyndham Deerfield Beach Resort offers beach wedding packages. No permit required for weddings on Fort Lauderdale beach, but there are a few guidelines. The beach area between NE 19th Street and SE 3rd Street is available on a first-come, first-served basis for weddings. Wedding parties are welcome to bring chairs, use a runner on the sand or a bridal arch for ceremonies. Named one of America&apos;s Best Beach Boardwalks by Travel + Leisure magazine, the Hollywood Beach Broadwalk stretches nearly two and a half miles along the Atlantic. Easily accessible via Fort Lauderdale-Hollywood International Airport. Lauderdale-By-The-Sea is a small, charming seaside town nestled between Fort Lauderdale and Pompano Beach. The Town’s quiet stretch of beach near their downtown area is known for their low-rise hotels that are located on the sand. Depending on date and other wedding parameters, LBTS requires a $100 park use permit. Applications for a permit must be submitted at least 30 days in advance of the date. Pompano Beach requires wedding permits for weddings held on the public beach. The permit can be obtained at the Pompano Beach Civic Center located on 1801 NE Sixth St. and costs $25. Also noteworthy is the Hillsboro Inlet Lighthouse. Although not accessible to the public, it is located behind a public beach, offering a unique and scenic choice among Pompano Beach wedding venues.